Tactic: Create a saved segment of donors who have within the last week to receive notifications when new gifts arrive. EverTrue allows you to run a search and then save it. We’ll notify you when new constituents match the criteria and are added to the list. If you do this for recent donors, you’ll be notified as gifts come in, then you can easily reach out with a note, email, or phone call as a thank-you. To save a segment, click the 'Actions' button in the top-right corner of the screen. 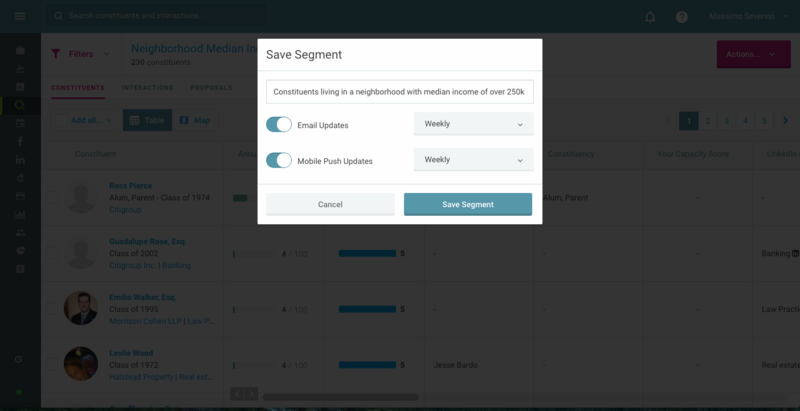 Name your segment and choose your update frequency preferences. Results: Improve the speed, organization, and efficacy of your stewardship outreach to keep donors happy.